Before I had even moved to my house, I knew the move was on the horizon and before I purchased boxes, I started purchasing items for my new homes bedroom. I didn't know how big or small my new room was going to be, nor did I know the layout and how much light got into the room, I did know how I wanted it though, and that was all that mattered. At the flat, my bedroom was quite mix and match, I had all four of my bedroom walls painted white, and with the large windows I had in there, it was a great room for natural light, perfect for me to take blog post photo's in, as well as being my safe haven, its safe to say it was one of my favourite places to be. The only problem with my room was its lack of accessories! At the house, I wanted different, I've still not got around to decorating my room - I'm starting to wonder if it will ever happen, but I know roughly what I want! I've purchased vintage style floral wallpaper, but I've also purchased lots of white paint if I decide to go with pure white walls again, I'm undecided on the flooring, I quite like the look of painted white floorboards, but I know how much I hate the cold, and lets not mention the spiders! I've also purchased lots and lots of accessories, is it bad when you have more accessories than teabags? 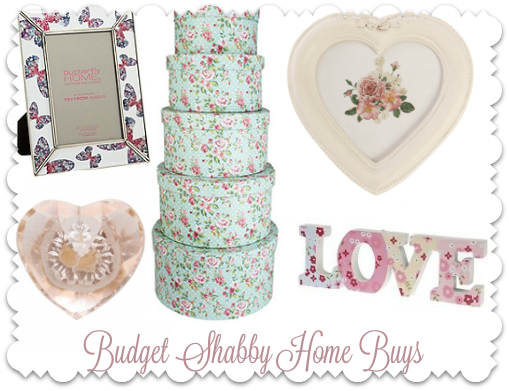 From hanging hearts to floral butterfly lights to hang on my shabby style bed - I think I have it all and I want to share with you some tips on how to go shabby on a budget, because I've not spent more than £10 on any accessory, and even going above £5 is breaking the bank to me! I use to freak out at the thought of second hand items, but now I'm older and wiser, I know some of the best pieces in life can only be purchased second hand! Check out local emporiums, buy and sell sites, online and offline auctions, boot sales and charity shops. Take your time rummaging through and don't be afraid to haggle if you can. Don't be afraid to get your fingers messy! Buy a plain white canvas, decorative butterflies, hearts, flowers (or whatever else tickles your fancy! ), the usual arts and crafts supplies including strong glue and make your own wall art on a small budget! Not only will your design see you saving pennies as you won't be buying from the shops, but it will also be unique and the only one in the world as it was made by you! If you're looking for vintage shabby chic items, the chances are you're going to find thousands of items fitting into that criteria. Be wise on your hunting, if you're searching for items online then search around differently, searching for vintage budget art and craft items will surprise you with the results (like the floral storage boxes featured). If shabby isn't quite your style, then don't worry as these tips will hopefully work with any theme! Space, monochrome, animal print, black and dark and all the rest, don't forget to check out idea boards and places like Pinterest too, just change things up a little bit and don't be afraid to mix and match ideas!